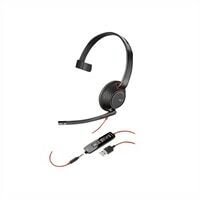 Plantronics Blackwire 5210 - 5200 Series Headset - on-ear Wired - USB, 3.5 mm jackThe Blackwire 5200 Series fits your busy workday. Easy to use, USB-C and 3.5 mm connectivity lets you work on a variety of devices. And it's so comfortable, you'll be able to wear it all day. The Blackwire 5200 Series-connect, work, seamlessly. The Blackwire 5200 Series fits your busy workday. Easy to use, USB-C and 3.5 mm connectivity lets you work on a variety of devices. And it's so comfortable, you'll be able to wear it all day. The Blackwire 5200 Series-connect, work, seamlessly.